Begin 2019 feeling empowered and whole! Dive into the new-year with excitement and dedication. Create a positive impact on your overall well-being by building or recommitting to a consistent yoga and meditation practice. Join Tristina and Michael for workshops every Sunday over four consecutive weeks. Yoga is much broader than just the poses. Each week you will learn the ancient teachings of the Niyamas, the personal observances of yoga. Discover how the Niyamas serve as compasses in your daily living and gain tools to make purposeful choices around thought, attitude, and action in your life. Take four weeks to commit to building a healthier relationship with yourself, others and the world around you. Be supported by your yoga community and break through the negative patterns of the past to start the year off with balance and intention! $149 to attend the YFL program. 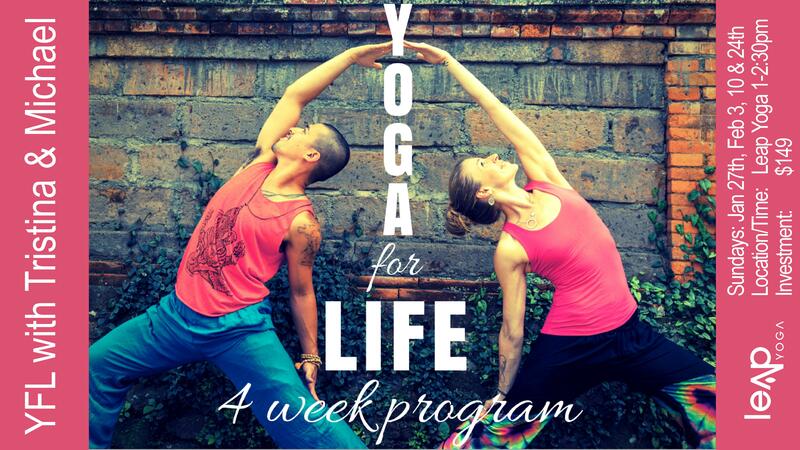 Not new to Leap Yoga but want unlimited yoga during the program? Inquire at the studio for membership rates. If you maintain a practice elsewhere, you can still partake in this program at the rate of $149!